A brand new image from Prometheus, Ridley Scott’s Alien prequel, has popped up online. 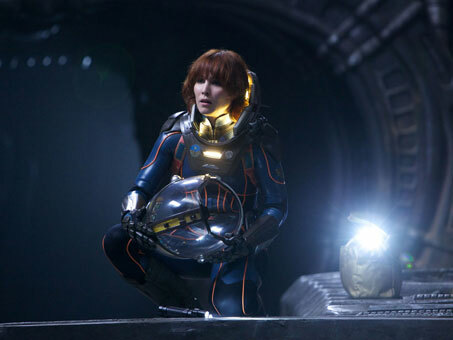 It features a closer look at the character being played by Noomi Rapace, in full space suit. The image originated on USA Today where they don’t seem to have any idea at all what’s going on this movie. Whatever Noomi’s looking it, she’ll probably regret discovering it eventually. Prometheus is about what happens when a group of astronauts accidentally unleash forces which may wipe out humanity. Swedish version of Girl with the Dragon Tattoo came out in 09, not last year…. but I’m pretty sure we all knew what you meant. It came out in Sweden in 09. It was released in the United States in 2010. It was Oscar eligible as part of the group of 2010 movies. This is a USA based blog.